Let’s look at the facts: (1) I have no new knitting to show you, and (2) I really, really should be writing a paper for business school right this minute. What does this mean? Well, in the procrastinator’s universe it means that it is time to bring you a new Pattern Radar post! This is where I show you which patterns have caught my eye over the past month or two. This is the Cable Round Sweater. The cables are framed by rib which gives it more shape than a traditional cabled garment, and the cowl is a separate piece which adds flexibility. 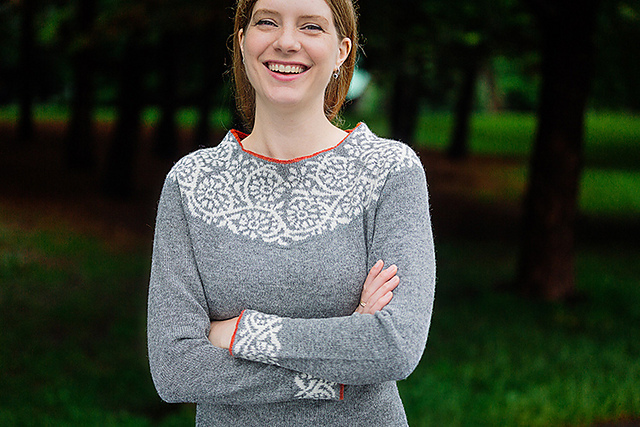 It is one of four beautiful sweaters that Linda designed for the September edition of Made by Me, a Norwegian-language knitting magazine. The other three are much more tailored and striking, but this one appeals to me. If you don’t read Norwegian, don’t fret; she will release the English-language patterns in the Fall. I love the bold lines, the graphic pop of black-on-white, and the slightly-oversized coziness of it. I’m particularly fond of the sleeves – those long rows of buttons on rib really grabbed my attention. 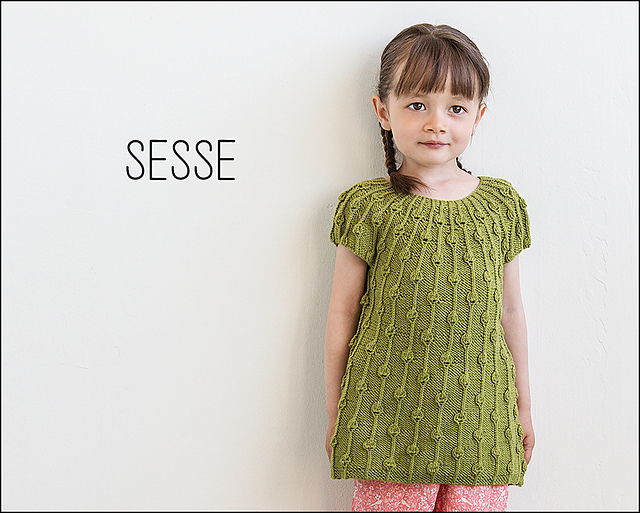 This is called Sesse and I think it’s pretty much perfect. Signe has this pattern, along with 10 others, available in English in an e-book which can be purchased on the Ravelry link here. This is the Lilynet dress and matching hat. I absolutely love this retro 60s/70s look. In fact, this dress reminds me very much of a dress my mother knit in the 1960s which I reported on in this blog post. I will definitely be keeping my eye on Jana’s designs. As you may know, I always keep my eye out for great menswear patterns. 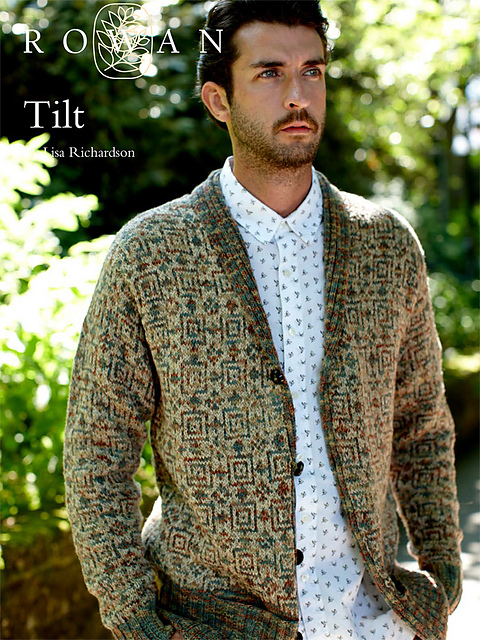 The latest one to capture my attention is Tilt, by Lisa Richardson. I love Lisa’s work (though we shall not mention the Richardson-designed wrap-that-never-ends that has been on my needles for a year now). I love that the incredibly rich colourwork is made by knitting fairisle with just two different yarns, one of them variegated; thus it looks more complicated than it actually is. Doug really likes this one, too, so it has definitely made its way into my queue. The photo is atmospheric and only gives a hint of the fabulousness of this Mint Wrap, designed by Marie Wallin and published by Rowan in Windswept: Collection One. Repeat after me: I will resist; I will resist. Again, the photo is a bit dark and atmospheric and doesn’t capture all of the colour and beauty of this design. I absolutely adore the contrast of the fairisle patterned bands with the plaid bands, and the unusual, almost jarring, colour choices. Love, love, love! Kirsten was inspired by Japanese sliding screens and I think she nailed it. I love the spare, stark lines. I love Kate Gilbert’s designs, and this one, from the Twist Collective, hits all of the right buttons for me. It is charming and looks so wearable – I can really see myself wearing this one everywhere. And that little peek of vibrant colour at the hems gives it just enough of an edge to keep it from being too sweet, if you know what I mean. This super chunky cardigan is designed by Josh Bennett for his Rowan Designer Collection: What do you become at night? The collection is based on a Little Red Riding Hood theme, heavy on the wolf motif. This is knit with Rowan Cocoon held double, which rules it out for me: if I were to wear it I’d end up like the witch in Hansel and Gretel instead (roasted, that is). I love Josh Bennett, who is equally at ease designing classics and over-the-top pieces, and clearly has a sense of fun. That’s it for Pattern Radar! Even the best procrastination must come to an end. This entry was posted in Main, Pattern Radar and tagged Fashion, Knitting, knitting design, Pattern Radar by knitigatingcircumstances. Bookmark the permalink. Thanks for the preview of things to come! Good luck with that “I will resist” mantra. I’ve been saying “I will not buy more yarn” for years and it still melts away at the touch of a skein! It never works for me either, but I’m trying to be good. Wow, I am so delighted to be selected to join such amazing designers on your pattern radar! Thank you so much, Kelly! Hi Linda, The only problem was deciding which of your new designs to include. I love them all…. Hi Kelly, oh that just leaves me speechless! Thank you so much! I love this selection 🙂 I will probably be knitting the mint wrap for my mum ! Oh, your lucky Mum! I really love that wrap! I love all of your picks, but have to admit I’ve fallen hard for Linda Marveng’s Cable Round Sweater. (And oh gosh – the styling of those photographs is beyond fantastic.) I wonder if it would work out with Rowan Felted Tweed? 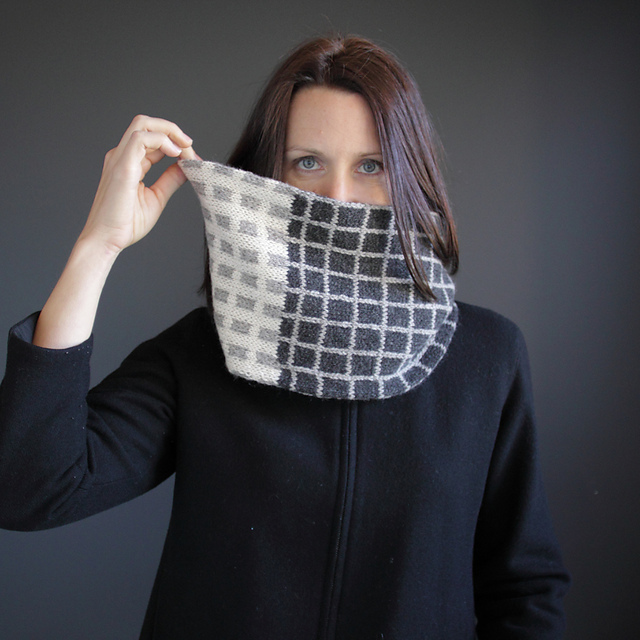 I love the concept of a separate cowl – it works for me on so many levels! You are quite the knitting temptress! Can’t wait to see what you get on the needles next. I could not resist answering this! Thank you so much! Rowan Felted Tweed is thinner than the sample yarn but it might work depending on your gauge. Otherwise, I think Rowan Tweed might work better. I love having a cowl too! Hi Ann, I think that the Felted Tweed won’t give you gauge, but perhaps you could hold it double? Or maybe use one strand of Felted Tweed with one of Fine Tweed held together (I bet that would look gorgeous, but probably eat into your yarn budget). Or as Linda commented, try the Rowan Tweed. Just think how warm and cozy this sweater will be when your farm is covered in snow again (I don’t have that issue here)! I am in a funk right now, trying to finish up a paper when all I want to do is knit. It’s like I’m addicted, hmm? Hope you got your paper in on time, and are able to settle down for a little bit of knitting. Linda’s sweater is a stunner and I am going to have a terrible time figuring out what color to make it (I mean don’t I get boring after a while if all my winter sweaters are grey?). So thanks for blowing out my queue with this. Sigh. I also want the dress. And the wrap. And. And. And. I’m always happy to enable my fellow addicts….